The spray-tan guns we review below are primarily designed for home use. Great for maintaining your tan without resorting to expensive salon appointments, or purchasing a spray-tanning bed (Source). Spray tanning guns often ship with a full bundle of accessories including tents, tanning solutions as well as various replacement parts (Source). These handy bundles equip you to get started spray-tanning right out of the box. These spray-tanning kits are also great for mobile beauty-care professionals who need portable options for their customers around town. Our top pick was the Maxi-Mist spray tanning kit. It ships with a heavy fabric spray tanning tent, a large carry bag, detailed instructions as well as a collection of spare parts. Its manufacturers write glowingly of its 300 W power and the German-engineered spray gun, all of which are designed to generate maximum atomization while diminishing overspray. One of the handier design features is the non-stick needle, which enables it to eliminate the problem of spray buildup as well as corrosion, both of which can lead to clogging of the spray tan gun. As well, the manufacturers describe that the design of the gun's trigger and tip enable you to optimally control the flow and pattern of the spray tanning solution with precision. One reviewer we spoke with said that it was worth the price, easy for him to get the hang of it, and a cheaper alternative than resorting to salons every month. Let's take a look at 5 of the best-selling spray tan combination kits on the market today. If you are looking for a way to have a good, nice and even tan without sunbathing or going to a professional, you might want to consider the Fascination spray kit system. Users love that this spraying bundle includes three tanning solutions, and that is so easy to clean afterward. However, some do note that there are no instructions how to use the different settings. With a weight of 9.5 pounds, this spraying kit has an adjustable flow control, and it is good for vertical, horizontal and circular spraying patterns. The solution cup is big enough for several tanning sessions and can be used as a base if you want to put the gun down. As a whole, it seems like a good choice, if you are looking for a good quality and a reasonable price. Generally, users highly recommend this airbrush tanning gun and praise its performance and accessories. One buyer comments that the gun sprays with a fine mist, the tan lasts for a long time, and it’s very easy to set it up and use it. Another pleased customer advises that it’s best if you use the preparation spray because it really makes a difference. He said that it took him a few tries to get the hang out of it, but after that, he didn’t have any problems and his tan looked even and nice. Most users complain that the tanning kit doesn’t include detail instructions and advise to be careful when spraying yourselves if you don’t own a spraying tent. This professional high-performance home spraying tanning system with HVLP turbine is stylish, effective and can be used by professionals and amateurs alike. Users love that the hvlp spray gun works without problems, sprays evenly and can be set up very easy. It’s also lightweight, so it’s no problem to move it. However, some do note that it’s noisy and advise you to use earplugs. This spray gun kit includes a 10-foot flexible air hose, a 4x4x6.5 inch spraying tent booth, a large tanning accessories kit, three additional solution cups with lids, four solution samples, and a user guide DVD. One user shares that the airbrush paint gun arrived in excellent condition, and if you pay attention to the details, it works great. He also states that this kit is ideal for a novice or someone starting a business, due to the large number of accessories that it contains. The only problem he encountered was how to take down the tent. Another purchaser comments that the hvlp turbine spray gun and the solutions work great. But he advises that you should be careful when you put up the tent and make sure that you clean everything really well to avoid clogging problems. One customer complains that the airbrush gun is too noisy, but he states that it works without problem, and it’s not a problem to move it around. The HLVP premium sunless spraying tan system offered by Turbo Tan seems like a good choice if you are looking for a tanning system of good quality, but lower price. Users love that this airbrush kit is easy to use, lightweight, but powerful and that it’s suitable for home use, professional salons or mobile tanning. However, some do note that this spray tanning machine is too loud and it doesn’t spray evenly. 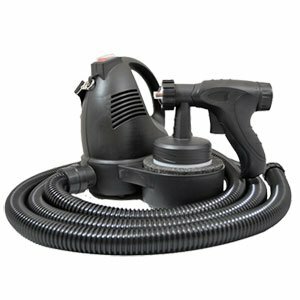 With a powerful 120 V turbine air pump unit, this tanning system includes also a 9-foot flexible hose, a professional hlvp spray gun, and a gun holster. One user shared that he was amazed how he did a full body tanning with two coats for about 30 minutes with the Turbo Tan spraying system. He states that this definitely saves him time and would help him deal with more clients. A pleased customer comments that this is the best tanning machine for him since it makes his skin look amazing. He would recommend it to anyone who wants to have a nice tan. Another purchaser advises to spray farther away from the body and then re-spray if there is a need, but as a whole, she is very pleased with the beautiful tan that she achieves. However, some customers were dissatisfied that the spraying kit arrived without instructions, and it was difficult for them to put it together. One user also says that this is more like a painting machine than a tanning one, and it wasn’t easy for him to use it. If you want to do some easy home tanning, you might want to consider this stylish and efficient Max-Mist sunless spraying kit. Users love that they don’t have to go to a saloon to have a nice and even tan and that this spray tan machine includes spare parts. However, some do note that the quality of the sample solutions is not that great and the gun sprays heavily. This home/mobile spray tanning systems has a 300-watt turbine air pump and can be used for horizontal and vertical patterns. It includes heavy fabric tent with a carrying bag, Tampa Bay solution samples, an instruction manual, a conical solution cup and on board gun storage. Overall, it seems effective and useful for spray tanning at home or for professional use. Users are mostly happy with the performance, durability, and mobility of the Mixi-Mist sunless tanning system. One buyer shares that his tan lasts for weeks, and it looks natural and even, without stripes or spots. This reviewer is pleased that the airbrush machine is easy to assemble and that she can spray herself without much effort. Another says that she achieved excellent results with the horizontal spraying, and it is a piece of cake to set it up and take it down. What most customers complain about is that the sample solutions do not work, and they wash easily after a few days. Some also complain that the spraying gun uses too much solution and that the instructions were not in English. There are several high-quality spray tanning machine kits available on the market today, as we have seen, and the Black Fascination FX kit was one of our favorites. 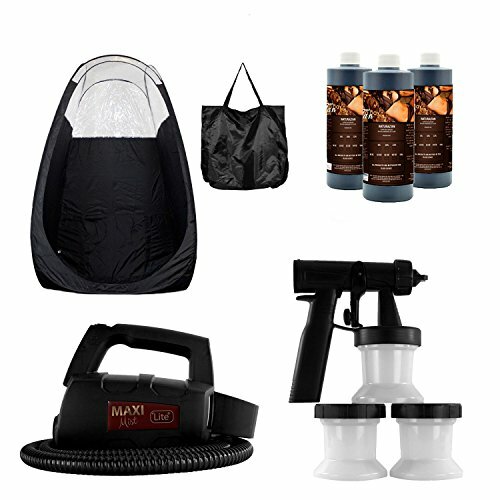 When you buy this particular bundle, it ships with a spray hose and gun, a spray tanning solution, a pH balancing spray, a carrying bag, as well as a design tent. Its manufacturers say that they have designed an ergonomic handle for its applicator to make it really compact and lightweight, which is ideal for mobile tanners but still strong enough to function inside of a professional salon. It is designed with a one-button control and its direct air intake contains a cleanable filter that is easily removable. One user we spoke to does all of her spray tanning at home and says that after watching a couple of YouTube videos she quickly got up to speed about how to do it the right way. She also says that she saves a ton of money doing it herself rather than booking expensive salon appointments to maintain her tan. Another buyer observed that this tanning machine is easy to control and provides and even spray. She also says that the supplied spray tanning tent is sturdy and tall. One other reviewer we interviewed told us that in regions of Asia they don't have tanning salons and they purchased this spray tanning kit as a nice alternative to buying a much more expensive tanning bed. On the downside, one reviewer who overall said that it was an excellent device says that the tent would be a little bit small for taller people, say over 6 feet. 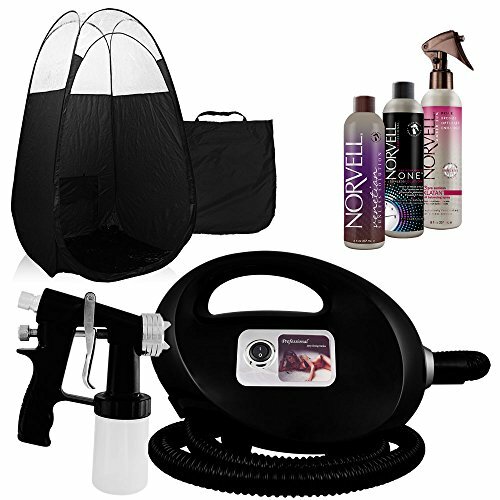 Buyers are also particularly impressed with the spray tanning product solutions by Norvell. The Turbo Tan Belloccio T85-QC spray tanning kit was another solidly received option. It ships with a spray tanning tent and a variety of accessories that include different tanning solutions so that you're able to spray for the full range of different skin-color types. Its manufacturers say that it is a natural tanning system designed to produce even tanning results complemented by a blend of antioxidants and vitamins to moisturize, revitalize and tighten the skin. Buyers that we spoke to say that it provides excellent value at a relatively low price, although some thought the machine a little bit too loud. One freelance salon professional operates a mobile spray-tanning business and says that they bought this spray tanning kit to provide sunless airbrush tanning services to their clients. He is highly satisfied with how it works, but also advises that you will need to screw all of the solution containers very tight, making sure to test for leaks, all of this prior to starting your session to ensure everything goes smoothly. In addition, he endorses this bundle for aspiring freelance salon professionals because with the number of items you receive with it you can quickly start up your own freelance tanning service. Personally, he prefers Norvell tanning solutions, saying that they work excellently with the airbrush machine for every type of skin tone, and should always be supplemented with barrier cream for knees, hands, feet and elbows. One downside he noted was that while the spray tanning tent is easy to open, collapsing it and rolling it back up was a little bit difficult, but over time he figured out the best way to do it. The Turbo Tan sunless airbrush spray system was another well-received option that provides a powerful but mobile spray-tanning solution, all ready to go right out-of-the-box. The buyers say that, in general, they are satisfied, but it does produce some annoying noise on account of an inflexible and rigid air hose. Another reviewer we spoke to purchased this as an alternative to a more expensive model they've been using for nearly a decade and say that it was easy to set up, lightweight, and has so far provided flawless spray tans for her clients. However, the reviewer we spoke to said that the machine broke after several months of use and when they contacted the company they were not able to get a return or replacement. Another problem users have is that it shipped without any instructions, which meant that users either had to resort to discovering the website and a PDF of the instructions or eyeball the unit and figure out how to assemble it on their own. One Maxi-Mist tanning kit buyer described to us a long process of experimentation before perfecting the liquid ratios of the spray tanning solutions. He also says that the optimum distance for spray tanning somebody else is around 8 to 12 inches from the body, and if you observe any of the liquid dripping you should take a step back because you are too close. He also advises that if you want to spray tan to last, you should advise your client to exfoliate before the tan and then moisturize with a high-quality lotion after they have showered. Another bit of advice is to do the spray tanning in the evening after they had showered. He says that it should be allowed to soak in overnight and then rinsed off in the morning if you want to see the best results. As well, if you are doing this for a loved one, they need to sleep on a separate blanket because the spray tanning will stay in the bed sheets. 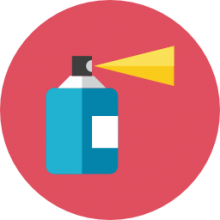 Another important concerns maintenance- in terms of keeping the unit clean and operational, when you are done with the spraying, you should pour the solution back into the bottle. Then you should fill the sprayer solution container with some hot water and put it back on the unit, put it on full blast and direct it into the sink- this will clean it out and keep it nice and functional for the long haul. There are even some cleaning solutions you can purchase online that will help to keep your spray tanning gun in tiptop shape. Another buyer we interviewed says that like many others they had grown weary of paying $45 a tanning session and ultimately decided it made sense to purchase their own spray tanning kit. This particular buyer uses it in their garage and she has trained a relative to do it for her inside of the spray tanning tent. The Fascination spray tanning kit was the last spray tanning system that we examined. It is a hot-pink kit that ships with Norvell spray tanning solutions and its buyers have provided relatively mixed feedback for it. One user complained that it was cheaply made and excessively leaked as well as overheated, while another buyer said that it was a quality machine for beginners that was easy to use and clean, though ideal mainly for light residential use.